Cinemablographer: Oscars Recap: Now That's What I Call an Ending! I’ll have to keep thoughts on the Oscars brief because work is being a little hectic lately. Overall, Jimmy Kimmel was a fun, if safe, host. He played up the anti-Trump sentiment well without overdoing it: keeping it light and breezy was probably the right choice, but tweeting a hello from Meryl Streep to Donald Trump was a highlight of the night. Ditto his jabs at Trump’s retort of “overrated” to Streep’s Golden Globe speech by asking everyone in the room to stand and clap for the queen. He was less successful, however, with a painful sketch in which he trucked in a busload of tourists to mingle with the stars. Every host now seems bent on injecting an interactive moment à la Ellen DeGeneres’s pizza moment and this gag didn’t work on any level. Where Kimmel did well, however, was in the night’s final blunder when he jokingly teased Beatty and asked, “Warren! What did you do?” and let the actor explain the mix-up before Kimmel could suggest the films share the prize. (I was confused and thought there was a tie.) 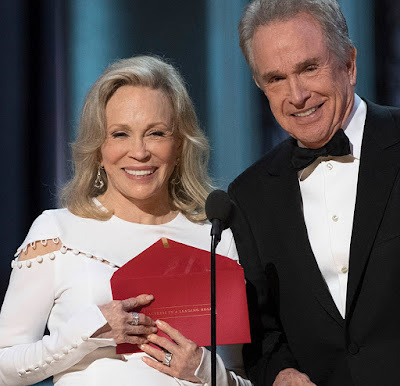 Whatever hangs-up one found in Kimmel’s so-so performance were overshadowed by the epic blunder with the envelopes. Credit the Moonlight upset to either the preferential ballot, an effort to correct #OscarsSoWhite, or a strong showing of passion for a little movie that could, but the film feels like a worthy winner. It’s also a historic moment as the first film with an all-black cast and a queer coming-out story to snag Best Picture. This win is a big deal for many people who don’t see their lives represented onscreen. The success of Moonlight should open a lot of doors. Highlights of the night on the winners’ front included Viola Davis’s powerful speech when she thanked the late Fences playwright and Best Adapted Screenplay nominee August Wilson for “exhuming and exalting” characters who didn’t get their stories told during their lifetimes. Best Sound Editing winner Sylvain Bellemare scored a happy victory on the Canadian front for his work on Denis Villeneuve’s Arrival, while the award for Best Documentary (Short Subject) going to The White Helmets was one of the best calls of the night. Low points included two wins for Mel Gibson’s uneven Hacksaw Ridge in the categories for Best Film Editing and Best Sound Mixing. Both categories were widely tipped to contribute to La La Land’s sweep and foreshadowed its upset. (But a tally of six awards for La La Land isn’t shabby.) Also disappointing were the five performances of the Best Original Song nominees—Sting was downright boring and John Legend’s take on the La La Land songs didn’t do them justice, while Justin Timberlake’s energetic “Can’t Stop the Feeling” made for a really awkward opening when he tried to get the stars to join a dance party. It looked like a bunch of people went to a bar without pre-drinking. At least Moana performer Auli'i Cravalho got bumped in the head during her song, which’ll hopefully discourage the future use of bizarre Cirque du Soleil stuff during the musical numbers. Still, this year’s Oscars will go down simply for its crazy ending. I don’t think ever understand how such a heavy favourite dominated the season only to lose in an unexpected and bizarre twist. People said the broadcast would reflect the politics of the day and, strangely, it did.